For over 120 years, Fleischer’s Hotel has been a cultural treasure for prominent guests wanting to indulge in a fairytale experience surrounded by Norway’s natural wonders. 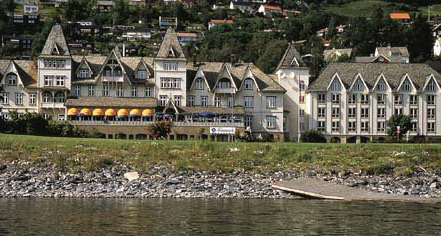 Fredirk Lyth Ørum Fleischer opened the hotel in 1864, and it has been operated by five generations of Fleischers. The Swiss-style hotel with its towers and spires entertained royalty for decades, and the hotel walls showcase artifacts and documents of esteemed guests, including an original signed guestbook, diplomas, and even the private toilet of Emperor Willhelm II of Germany. Throughout its celebrated history, the hotel has remained a coveted location for a luxury vacation. With classic warmth and traditional elegance, the hotel offers visitors 115 Swiss-styled guestrooms, individually styled for comfort and convenience. 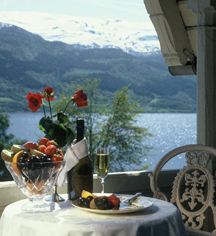 Whether guests come to conquer the fresh ski slopes of nearby Voss or to relish in the inspirational majesty of the Norwegian Fjords, Fleischer’s Hotel is the ideal place for visitors to savor the historic beauty of the region. As one of the finest historic treasures in Norway, the family-owned and operated Fleishcher’s Hotel continues its legacy of gracious hospitality and legendary service. Fleischer's Hotel, a charter member of Historic Hotels Worldwide since 2011, dates back to 1864. The hotel corridors are adorned with documentation of the aristocratic visits with displays that include an original guestbook, ornate diplomas, King Leopold of Belgium’s gold tiepin decorated with diamonds, and the private toilet of Emperor Willhelm II of Germany. Pet Policy: Service animals allowed: Yes. Pets allowed: Yes (Not allowed in Hotel, Only in Motel) Dogs are welcome. Please note only certain rooms allow pets. Learn more about the History of Fleischer's Hotel .